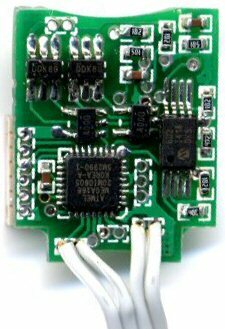 This µModule replaces the built-in electronics of many standard R/C servos. It adds the same features to a servo that the µModule H-Bridge module offers. It is capable to drive up to 1.5A servo motors and uses the built-in potentiometer for position-feedback. For modified continuous-rotation servos it offers the same back-EMF based speed-control than it’s larger cousin offers. It operates from 5V. and communicates using the TWI interface that’s common among all µModules. It also has an optional logic-level RS-232 interface. Due to size constrains the module does not use the standard µModule interface headers but is electrically compatible with all other modules. A wide range of feedback options are available on the module to provide additional health-monitoring and establishing closed-loop speed-control functionality. Both voltage (relative to the ground) on the motor connectors can be monitored as well as the voltage across the current-sense resistor which is proportional to the current flowing through the motor. Monitoring these values with a 10-bit resolution A/D converter precise knowledge of the current system status can be established. These measurements can be used to calculate the back-EMF response of the driven motor, which is proportional to the rotation speed. This value in turn can be used to close the control loop and create a true speed-controlled H-bridge. For traditional servo control, the module uses the R/C servos integrated potentiometer as feedback. 0 int16_t RequestValue R/W Position or speed control request signal R/W (Scaled between -0x3fff and 0x3fff). 0x4000 is freewheeling and 0x4001 is braking.